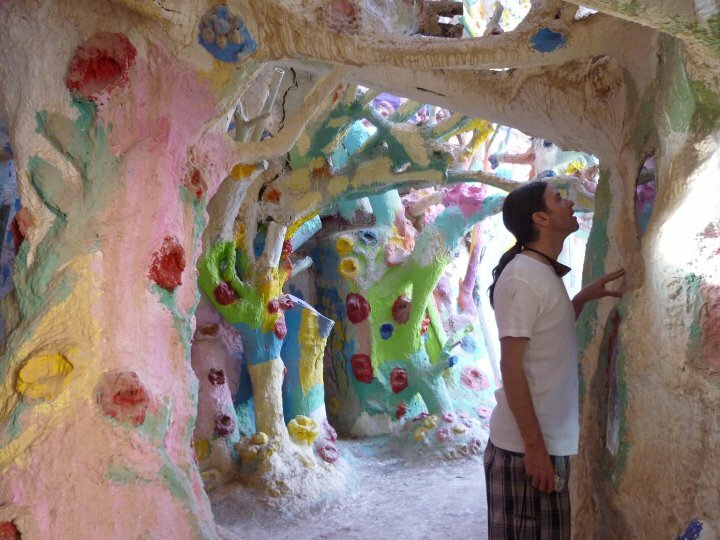 The Salton Sea area is hands-down the freakiest and most fabulous place in all the desert…if not in the entire USA. If you’ve never heard of it, check out the documentary John Waters made about it: Plagues and Pleasures of the Salton Sea! The sea looks so pristine from a distance. The “sand” on the shore is actually dead fish bones and teeth! The Sea is the biggest lake in California, yet most people have never heard of it. It was created by accident, from rainwater and agricultural runoff that collected into a giant cesspool when a dam broke during a huge storm one year. Back in the day, the water was actually fairly clean and lovely, and it was a hi-class resort for people from L.A. But since the only source feeding it is agricultural runoff, over the years the water has gotten more and more salty…until now it’s just a stinking pit of death and decay!!!!!!!!!!!!! There are still some die-hard nut jobs who live out there in these bombed-out looking trailer parks in Bombay Beach and other weird little settlements around the shore of the Sea…but for the most part, it’s a desolate, post-apocalyptic wasteland. FAB-u-LOUS! 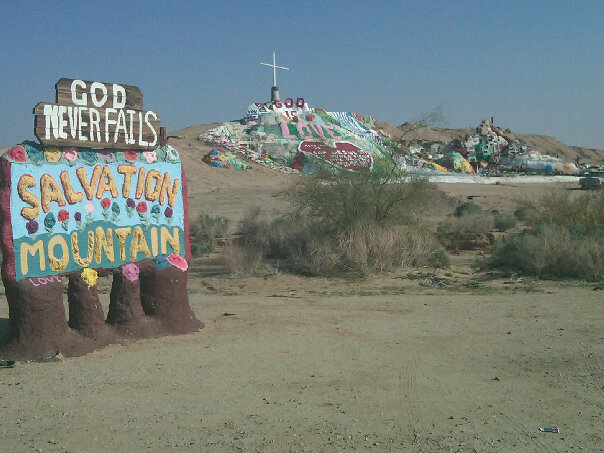 Nearby in Niland is this fantastic arts-n-crafts monument to Jebus called Salvation Mountain. Some kooky old man built the entire thing out of decoupaged hay bales, and he was more than happy to tell you allllllllll about it if you only asked; before his death he gave tours and talked to tourists all day long. He was amazing, and volunteers still maintain the site. 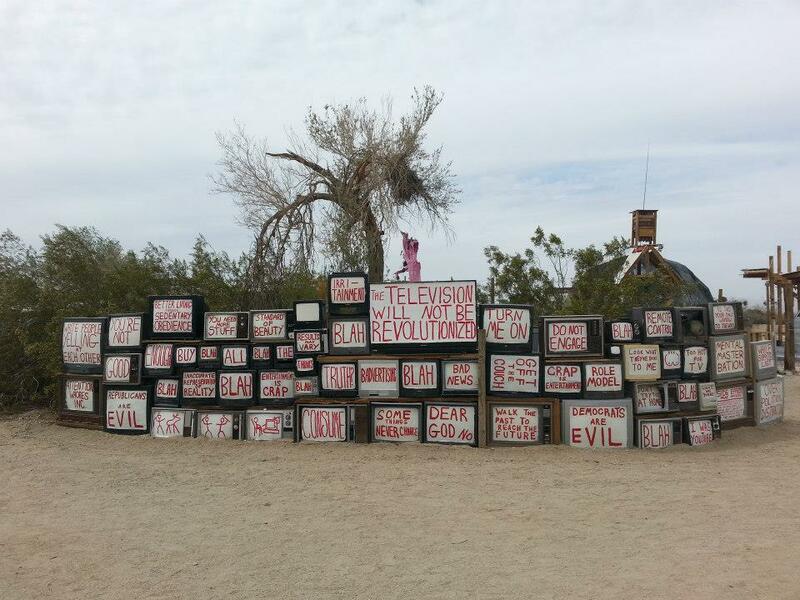 Another amazing thing in the area near Niland is this old naval base that was demolished long ago, leaving only the concrete foundation slabs of the buildings…which hippies, weirdos and snowbirds camp out on all winter long, every winter. 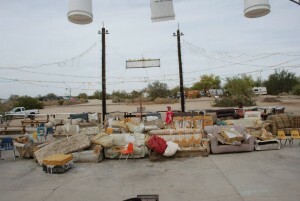 Hundreds of them live there basically permanently, and they call it Slab City. It’s sort of like a permanent Burning Man encampment…only methier!!! 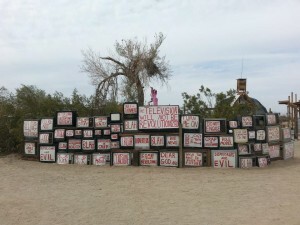 The best part of Slab City is this annex of crazy artists, who built a sort of enclave off to the side called East Jesus. I CANNOT EMPHASIZE ENOUGH HOW COOL THIS PLACE IS! 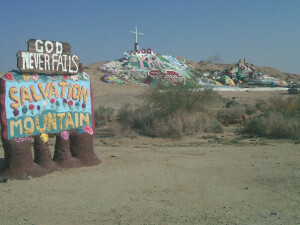 It’s full of amazing art, and the people there were super friendly when I dropped in, and gave me a tour and everything. I have many more photos here. Just outside Slab City there’s even a hot spring/mudhole…but it’s pretty gross, since all the hippies and kooks pretty much use it as their bathtub. It’s also the only hot spring I’ve ever been in that is carpeted — for some reason, they figured it would be a good idea to lay carpet down on the mud bottom. The carpet is really soggy and gross, but I guess they do change it out periodically. WEIRD! I remember the first time I came here, I saw this freaky circus-type tent camped down on the shore of the Sea…some kind of weird traveling hippies were living there, and it made me so jealous. At the time, I had a job I had to get back to in Vegas…but nowadays I have no such albatrosses tying me down. So……………… who wants to go?????? MANY more photos and info here. 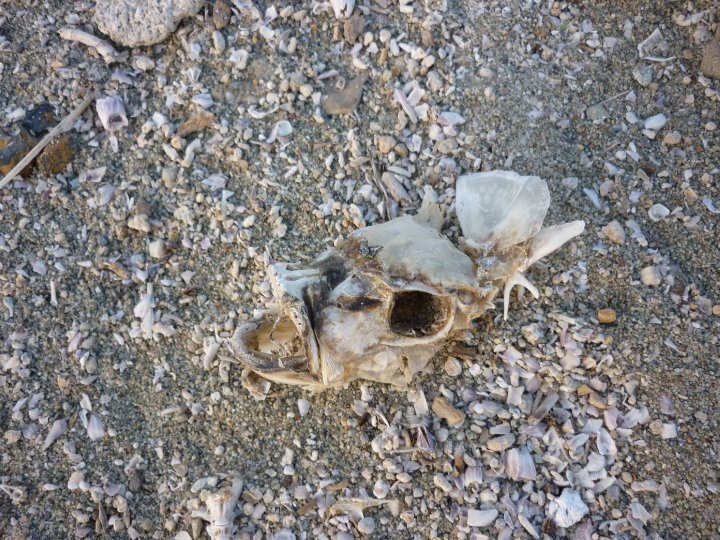 The salton sea is the only place i ever windsurfed in a massive pool of dead tilapia! It was surreal. Locals said it was an annual occurrence and a natural dying off due to …? I think it’s caused by the pesticides in the agricultural runoff from the fields nearby…something weird like that! The Tilapia die off due to heat and high salinity. 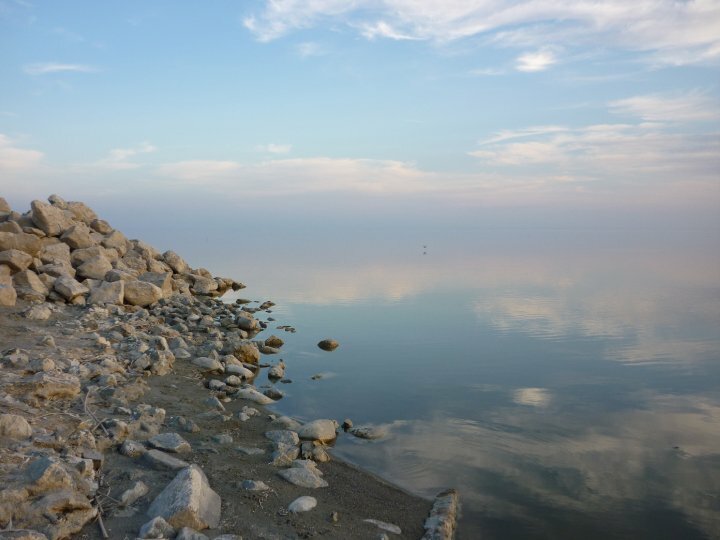 There are pesticides and heavy metals in the Salton Sea but the real problem is the salinity and heat. 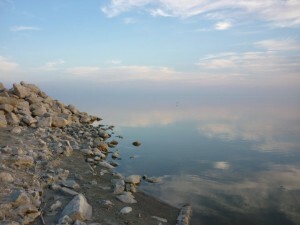 Tilapia, indeed the only species that now grows in the Salton Sea, are adapted to high salinity. Sea water is about 35 g/L (or 35 parts per thousand) depending on where in the world you are. Middle eastern areas that are very hot with higher rates of evaporation have higher salinity, perhaps 38 g/L. 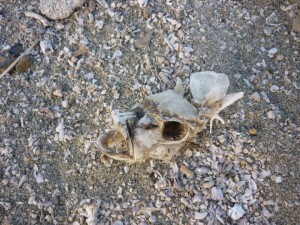 The Salton Sea has no exit, just like the Great Salt Lake, Mono Lake and the Dead Sea. Over time the salinity has increased to about 55 g/L so that now only Tilapia can survive, and that’s just barely. The high salinity reduces the dissolved oxygen concentration, and the warm water reduces it even further. So these most tolerant fish dye in the warm weather. The decaying fish consume oxygen which reduces the dissolved oxygen (DO) even more. The die off continues until there is a break in the weather or a rain event (rain cools the lake and adds a little DO). So it is not the heavy metals or the pesticides that kill the Tilapia, it’s heat and salt. The pesticides and metals don’t help the fish, but it’s not like Kesterson where the high selenium caused fish and bird kills. Runoff to the Sea from the agricultural lands is declining. The City of San Diego paid the Imperial Irrigation District to conserve water by lining their canals, among other things. So the conserved water is directed to San Diego and runoff to the Sea is much less. As it stands now, unless something changes, the Sea’s salinity will sky rocket to 250 g/L., like the Dead Sea and it will shrink to perhaps 20% of its current size. The newly exposed shore areas will dry out and dust storms will create health problems from Palm Springs to the Mexican border. There are proposals to avoid or at least partially avoid the problem, but they cost billions. Prior to the Great Recession starting in 2007, California in co-operation with Federal agencies developed several plants, peaking at $3B cost. Those plans were shelved with the recession. They have been renewed, now peaking at $8-10B, but with the new Republican Senate, I fear there is no hope for the Salton Sea. 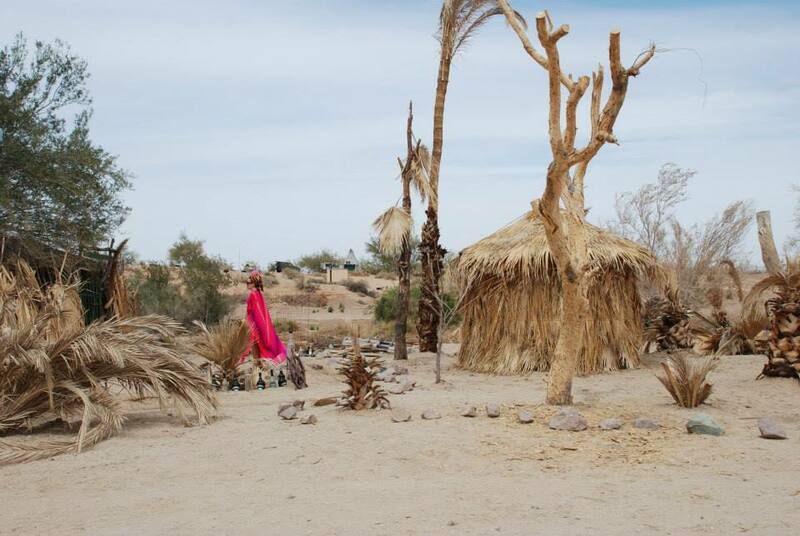 Visited Bombay Beach a while back and seen Hunky Dad by his home. OMG yes, I have seen it!! I love Hunky!!!! mike from the Fl. Keys here. 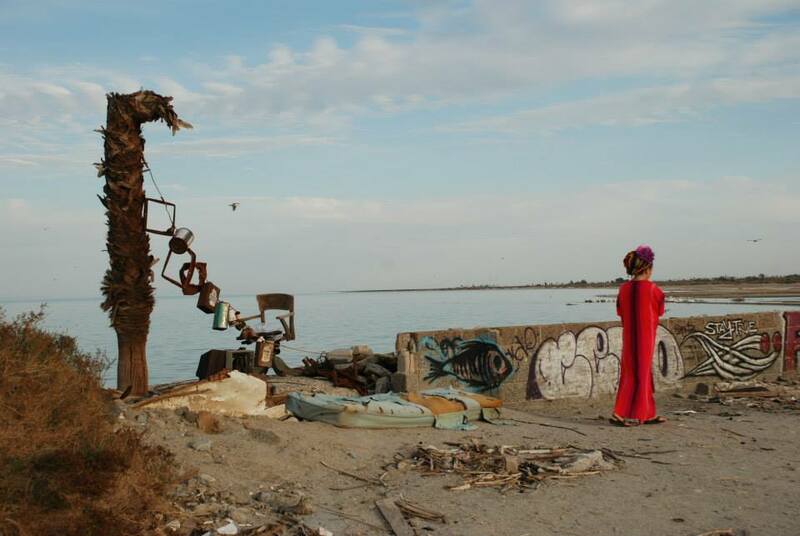 spent a good portion of my youth at the Salton Sea. my grandfather had a house in Bombay Beach in the Heyday . it was so much fun back then fished , water skied , dirt bikes, even ate the fish we caught and i’m still alive!! the State park by Bombay would be packed with people on Holidays, tons of fun. Great memories.You wouldn’t believe what it looked like back then, beautiful.